If you are needing a simple and comforting meal, you will want to make this One Pot American Goulash. 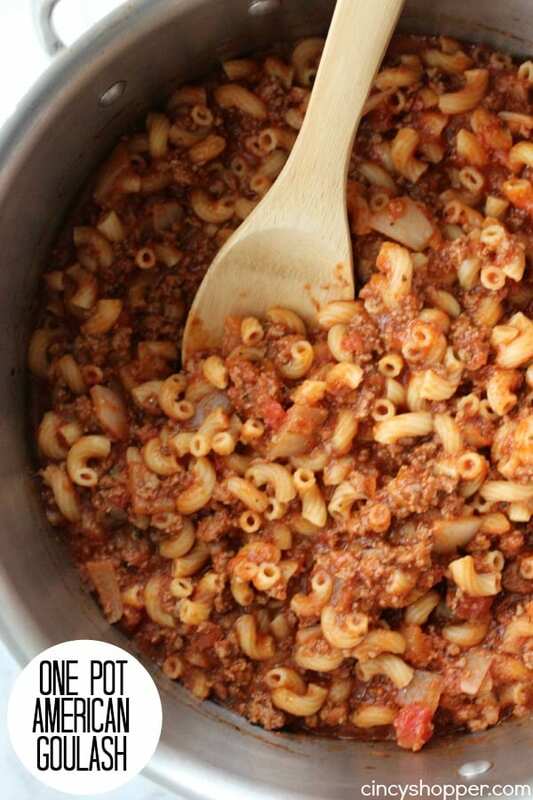 This dish is super simple, all made in just one pot on your stove top. 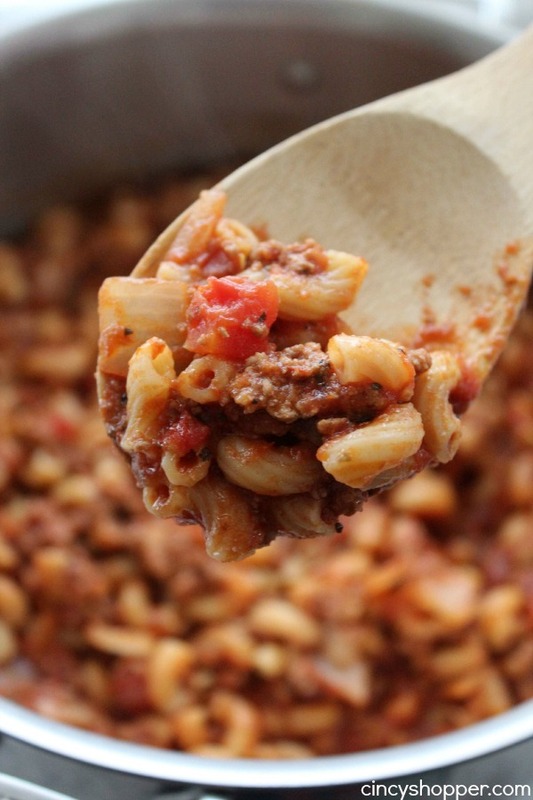 Goulash is a very traditional dish that many of us grew up on. Comfort food that is quite inexpensive for feeding a larger family. My grandmother would make goulash quite frequently while I was growing up. It is one of those dishes that I like to make when my food budget is tight. Inexpensive meals are the key to stretching my food budget. Using ground beef always saves us. Our Slow Cooker Meatloaf is normally my go to recipe when I have ground beef because I know everyone loves it. Last month I made this recipe and everyone asked for it again this week. PERFECT! 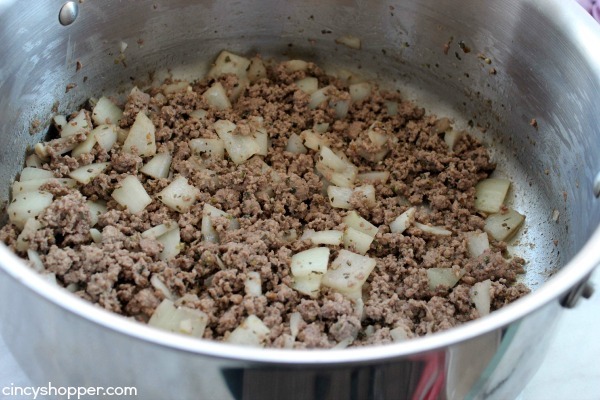 One pound of ground beef some elbows, canned tomatoes and spices makes this dinner inexpensive. I paired our American Goulash with a salad and some garlic bread for the kiddos. Since everything is cooked in just one pot, there is no mess in my kitchen. After I have had a comfort food meal the last thing I want to think about is dishes, ha ha! In a medium pan, brown ground beef over medium heat. Add onion and garlic and cook until onion is slightly tender. Add remaining ingredients stir well and bring to a simmer. Cover and cook for 20 minutes until macaroni is tender. Looks delicious! 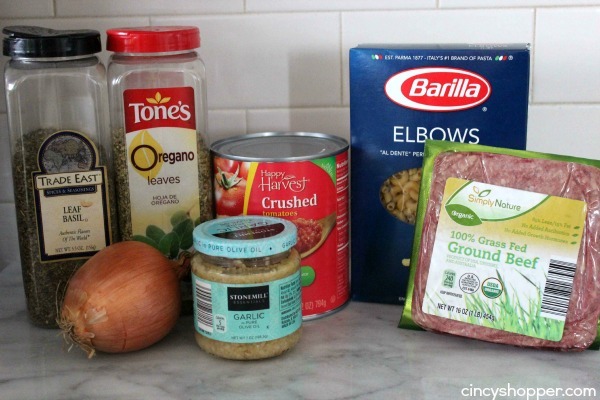 I have everything I need to make this for dinner tonight. Thanks for sharing – I found your post on Titus 2sDay at Time-Warp Wife. Just add some bell pepper and you got what we in New England call American Chop Suey. This dish reminds me of my childhood. YUM! Great post! I love goulash, but I’m the exception in my family. I really like making mine with whole tomatoes. Then I squish them up real good with my hands, leaving nice chunks of tomatoes in my goulash, Why? Because I love tomatoes! Thanks for sharing this recipe on the Living with Style Linky Party! Maybe add some red pinto beans? I meant red kidney beans. That’s how my mom made it. Good! When I make this I layer it like Lasagna (spelling?) I add pepper jack, mozerella and sharp shredded cheese, bake on 375 and when it is bubbled take it out of oven. I’d like to hear how you do that. This is very similar to one I make. Try this, you are sure to like it! Brown the Elbows in hot Olive Oil, until golden, then add them to the pot along with a can of Tomato Paste. I also add a pinch of Cayenne Pepper. You will love the nutty/smoked flavor it adds. Whenever I make this my husband won’t stop talking about how much he likes it! I add bell pepper just because I love them. Thank you! You should add little cheese. I always add cheese to my goulash. Use Mexican blend cheese. SOOOOO GOOOOD!!! how many servings does this make? Does it fill a crockpot full? Yes if u use box of noodles and 2lbs of beef u will need big pot use tomatoes sauce and 3 cups of water diced tomatos too yum. Add Worcester sauce to the meat omg love!!!! I always cook the hamburger with green pepper and onions and then put it in a pot with cooked macaroni and cheese. I add a can of yellow corn and garlic powder and heat everything up together. It is better the next day after being in the refrigerator over night.i add some garlic bread toasted with butter and garlic powder and it’s a one pot meal.